After the death of Methodius, the Archbishop of Moravia, Prince Svatopluk withdrew his support for the Slavonic translation of the New Testament and evicted its followers from Moravia. The Bulgarian Tsar Simeon, a learned leader with a passion for Byzantine literature, gave them refuge and encouraged them to continue their work. Mucha immortalises the expelled followers of the Slavonic liturgy in the Byzantine frescos that adorn the walls of the basilica. 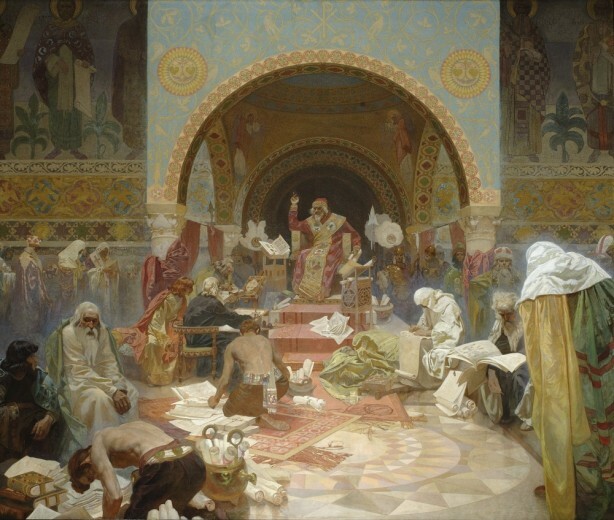 He places Tsar Simeon at the centre of the composition, communicating with his scholars and scribes in the foreground while the official members of the church and court are relegated to the background. Mucha’s use of rich colours and warm tones draws the viewer’s eye through the picture and up to the figure if Simeon and capture the splendour and nobility of his intellectual pursuits.